The Momentus Speed Whoosh golf training aid will help you train the fast twitch muscle fibers in your body and gain 7 to 10 mph more club head speed in less than 6 swings. This additional club head speed translates into 20-30 yards more distance with your driver. Not only will you gain distance, you'll also improve the proper timing of your release with the integrated magnetic timing ball. 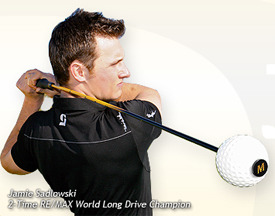 Top PGA Tour players are using the Momentus Speed Whoosh golf training aid, so should you! If you have any questions regarding the Momentus Speed Whoosh Golf Swing Trainer, please give us a call, we would be happy to help you with any questions you may have. Write an online review on the Momentus Speed Whoosh Golf Swing Trainer, and share your thoughts with others.